Most flat roofs pose different installation challenges versus a conventional steep sloped roof. Most roofs in Washington DC are flat or nearly flat with a slight pitch. Ideally, most roof systems must have a system installed that will either correct the pitch or be able to withstand the effects of ponding water. In order to correct a roof structure that has standing (or ponding) water, a tapered insulation system can be installed. At Bradley Construction, we normally suggest installing a single-ply membrane roof system. The next issue is to decide which type of single ply roof should be used. Most people have the impression that all single-ply membranes are alike and nothing can be further from the truth. Just because they are called single-ply membranes does not mean that they will perform the same. Like most products, there are a variety of features from one manufacturer to another. Single-Ply roofing membranes have been installed on roofing projects for over 25 years. Some have performed well while others are doing poorly or are non-existent today, while others have recently come into the marketplace. In designing performance characteristics in a single-ply membrane or single-ply system you have to keep in mind what elements the material is going to be subjected to. Roofing membranes need to perform 24 hours a day, seven days a week, without resting periods. Roofing membranes are exposed to UV Rays, rain, snow, hail, standing water, micro organisms, chemical pollutants, vast temperature changes, wind and dynamic flexing, etc. Two of the most widely installed sytems are TPO and EPDM. EPDM provides a high tensile strength, single ply membrane that will provide long term water tight integrity.The product maintains flexibilty in severe cold or heat along with excellent resistance to UV and ozone. TPO also displays the characterists above, coming in white, which reflects 78% of the sun’s ray to help reduce airconditioning costs. To learn more about possible cool roofing options go to cool roofs on the Dept. of Energy’s site. 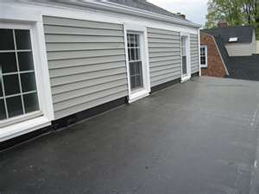 Bradley Construction has years of experience installing flat roofs in the Washington, DC area. Let our experts go over the different options for your flat roof replacement. Rockville, Potomac, Bethesda, Chevy Chase, Silver Spring, Washington DC, Gaithersburg, Germantown, Poolesville, Damascus, Frederick, New Market, Columbia and other communities within Montgomery County, Frederick County, Howard County, Carrol County, Prince George’s County and Fairfax County, VA. Thinking about a room addition? Bradley Construction is fully licensed and insured in Maryland, DC & Virginia.